Take a look at UK and US 10-year government bond yields over the past few decades and you’d struggle to say which was which. In the words of the FT last year, “The benchmark 10-year Gilt might as well be draped in the stars and stripes”. And even relatively short maturity UK and US bond yields are highly correlated. But what is behind this co-movement and does it matter? Source: Bloomberg and Bank calculations. 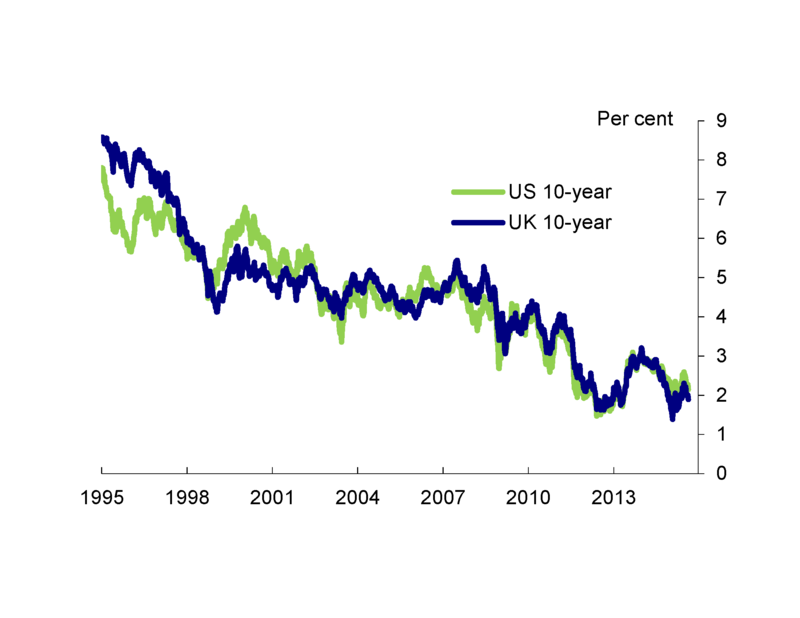 As you can see in Chart 1, there has clearly been a common downward trend in both UK and US 10-year yields over the past few decades. But week-to-week, day-to-day and even minute-to-minute movements are also very highly correlated. Whilst this is nothing new, this co-movement has been particularly strong in recent years. Of course, this isn’t just another manifestation of the special relationship – changes in US yields are correlated with changes in yields across the world, in both advanced and (to a lesser extent) emerging economies. And UK yields are also highly correlated with German yields, sometimes more so than with US yields (though this partly indirectly captures the correlation of US and German yields). This co-movement isn’t just a feature of 10-year bonds. 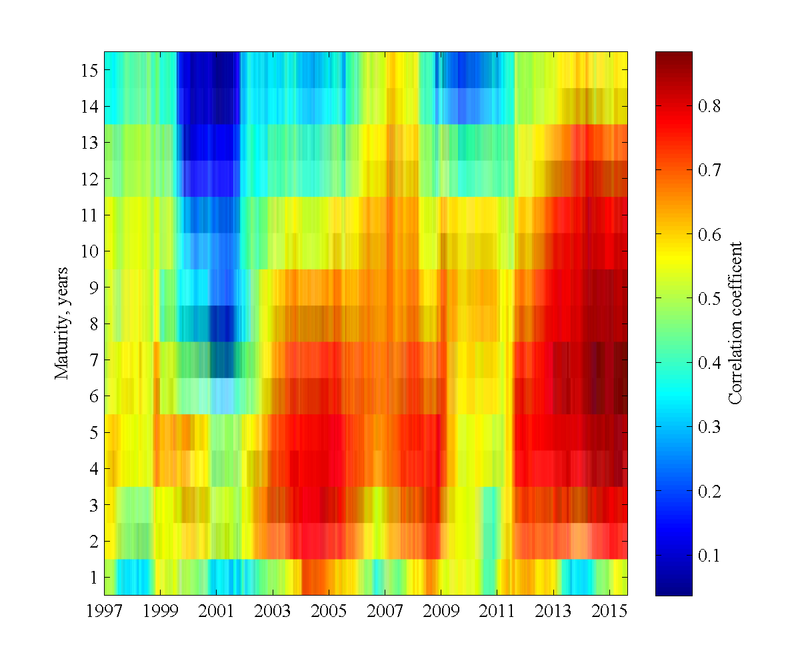 Focussing back on the UK, these heatmaps show rolling correlations of weekly changes in UK and US yields for different maturities. You can see there is strong co-movement (orange and red patches) between UK and US yields even at maturities as short as 3-years. Source: Bloomberg and Bank and author’s calculations. Looking under the bonnet of these spot rates, here are analogous rolling correlations of instantaneous forward rates. This suggests that a lot of the strong correlation of 10-year spot yields is coming from highly correlated 3 to 7-year forward rates. That means this co-movement of long-term yields reflects co-movement at short horizons as well as longer horizons. So what’s behind this co-movement? Well, it could reflect people thinking future policy rates in the UK and US will be correlated. At short horizons, it’s plausible that people expect UK and US business cycles to be somewhat synchronised, given the importance of global spillovers and the fact that the UK is a small open economy. And longer term policy rate expectations reflect expectations of long-run real rates (which are affected by global factors) and long-run inflation expectations (which should be pinned down by central bank inflation targets). But bond yields don’t just reflect policy rate expectations. They also include compensation that investors demand for buying a long maturity bond rather than rolling over a series of short maturity bonds – this is known as the term premium. And it’s very plausible that advanced economy term premia co-move. In integrated financial markets, attitudes to risk are determined globally rather than locally. We could also observe co-moving term premia if advanced economy government bonds are seen as having similar risk characteristics. For example, investors may well be using simple rules of thumb, extrapolating past correlations and treating ‘safe, liquid government bonds’ as an asset class, rather than looking at specific markets. The rise of global asset managers could have a part to play here. There’s also a strong role for spillovers from overseas unconventional monetary policy. For example, we observed particularly close co-movement between US and UK yields during the 2013 ‘taper tantrum’. And, over the past year, expected, announced and actual ECB sovereign asset purchases may have become a more important driver of UK – and even US – bond yields. Does this co-movement matter? Absolutely! Bond yields do feed through to financing costs for households, companies and of course the government. For example, UK mortgage rates increase by around 50bp on average in response to a 100bp increase in US swap rates. As the UK is a small open economy with a large financial sector, these international financial linkages are important for policy makers, both from a monetary and financial stability perspective. 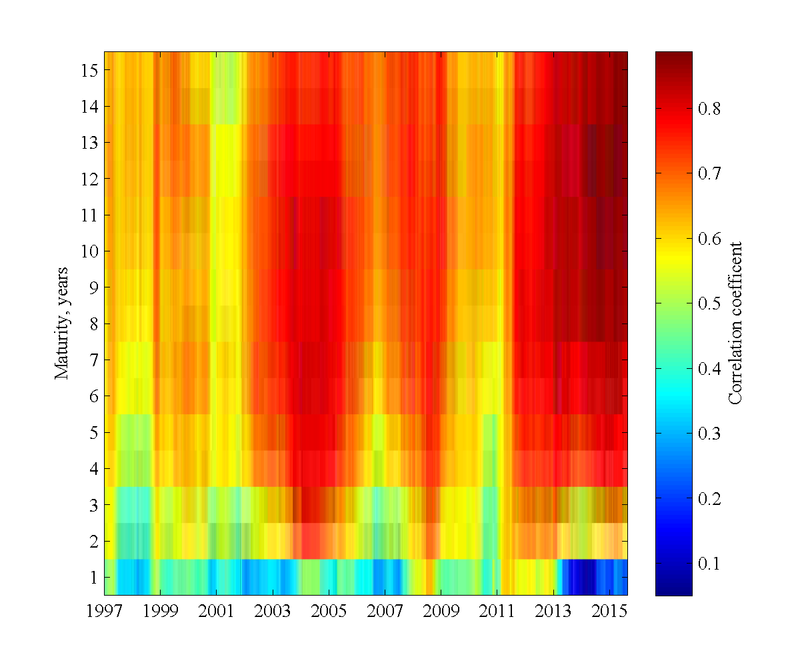 Previous Post Has corporate bond market liquidity fallen?